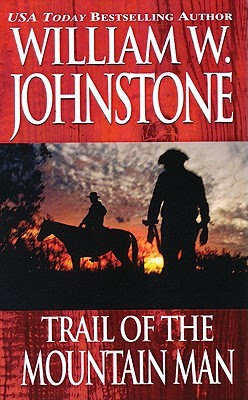 The third book in William W. Johnstone's western series arrived in 1987 proving that the author was delivering a book a year for this series among all the other genre fiction he was writing at the same time. Either he was way behind on child support payments or had a serious insomnia issue. Nobody wrote this much, not even that Maine hack King. Amazing how much output came from this author in so little time. He was putting it out faster than Ginger Lynn back in the day. Nevertheless, Smoke Jensen and his mountain man Preacher are back at work with "Trail of the Mountain Man". Smoke and Sally have settled down on their Sugarloaf ranch in Colorado and are raising an adopted son named Ben or Billy (the stable boy from book two). A vein of gold is found in a little town called No Name and it sets off a furious chain of events for the Jensen family. Hundreds of gold rushers ride into town and start staking claims all over the area. With a gold rush comes a boom town and the ill-effects leads to gunfighters, brothels, gambling and reckless abandonment in search for the almighty dollar. Whorin', cheatin' and swearin' is what's happening and boys it's catchin'. With this much action threatening to consume the Jensen property into a boatload of sin...well it's only a matter of time before Colt .44 lead be a flying. Smoke's land has a piece of the gold vein on it and even though he has staked the land and it's minerals to himself...there are still those bad old apples that have to break all the rules. Smoke fights for himself and some other homeowners who are too lazy to lift a gun once their rights are infringed upon. With a whole town of thievery and lawlessness Smoke is backed into a corner and fights his way out with the help of Preacher and some aging "last" mountain men. And boy are they just hankerin' for a fistful of fight. In many ways this is a more superior novel than it's predecessor and brings in some of the lovable parts of the mountain men. Their antics are pretty dang funny and when the bullets start flying they prove they are more than just fat fodder. This is laughable, enjoyable and action packed. It's quite simply just a good western tale and one that cements the early stages of this long running series.